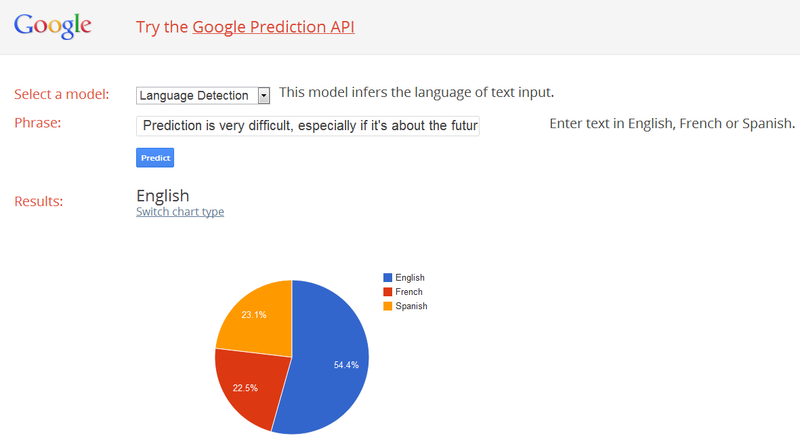 One of the exciting APIs among the 50+ APIs offered by Google is the Prediction API. It provides pattern matching and machine learning capabilities like recommendations or categorization. The notion is similar to the machine learning capabilities that we can see in other solutions (e.g. in Apache Mahout): we can train the system with a set of training data and then the applications based on Prediction API can recommend (“predict”) what products the user might like or they can categories spams, etc. In this post we go through an example how to categorize SMS messages – whether they are spams or valuable texts (“hams”). 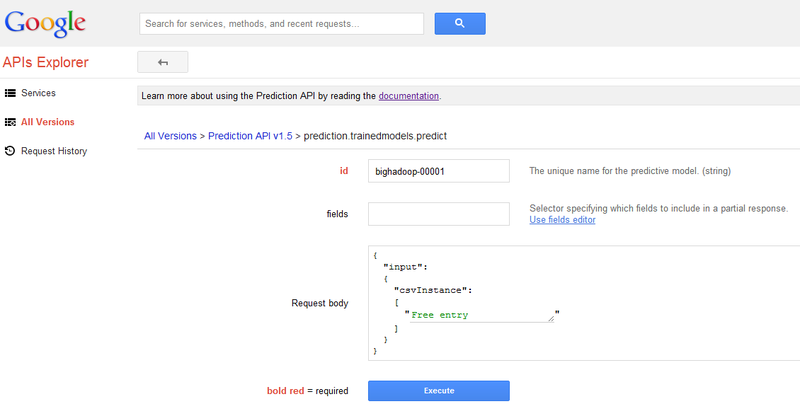 In order to be able to use Prediction API, the service needs to be enabled via Google API console. 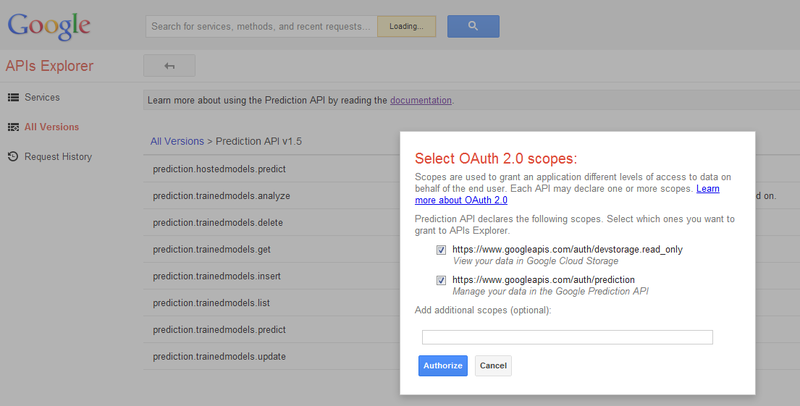 To upload training data, Prediction API also requires Google Cloud Storage. The dataset used in this post is from UCI Machine Learning Repository. UCI Machine Learning repository has 235 datasets publicly available, this post is based on SMS Spam Collections dataset. To upload the training data first we need to create a bucket in Google Cloud Storage. From Google API console we need to click on Google Cloud Storage and then on Google Cloud Storage Manager: This will open a webpage whe we can create new buckets and upload or delete files. 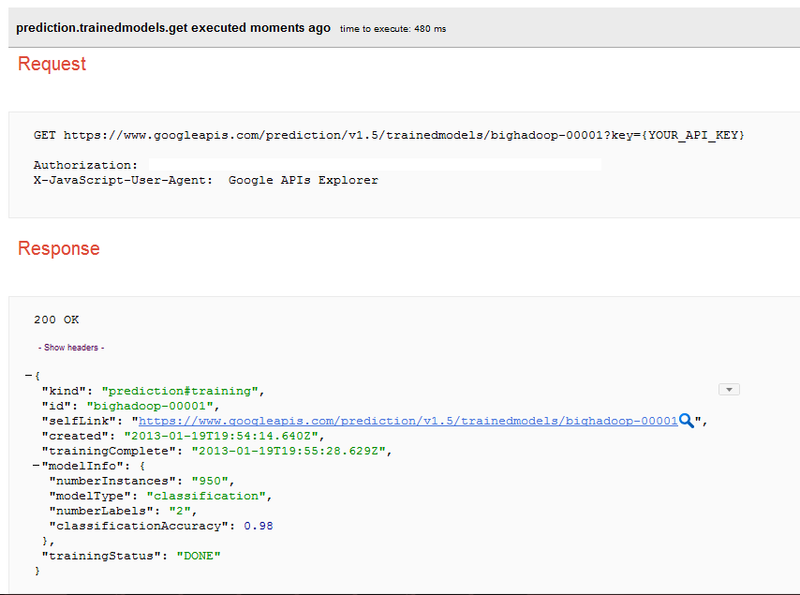 Google Prediction API offers a handful of commands that can be invoked via REST interface. The simplest way of testing Prediction API is to use Prediction API explorer. Once the training data is available on Google Cloud Storage, we can start training the machine learning system behind Prediction API. To begin training our model, we need to run prediction.trainedmodels.insert. All commands require authentication, it is based on OAuth 2.0 standard. The training runs for a while, we can check the status using prediction.trainedmodels.get command. The status field is going to be RUNNING and then will be changed to DONE, once the training is finished. Google also offers a featured sample application that includes all the code required to run it on Google App Engine. It is called Try-Prediction and the code is written in Python and also in Java. The application can be tested at http://try-prediction.appspot.com. For instance, if we enter a quote for the Language Detection model from Niels Bohr: “Prediction is very difficult, especially if it’s about the future.”, it will return that it is likely to be an English text (54,4%). client code running the browser. # raise an exception if credentials not found. # access to prediction API client library. # Read and parse JSON model description data. # Get reference to user's selected model. # Build prediction data (csvInstance) dynamically based on form input. // Retrieve server credentials from app engine datastore. // Extract tokens from retrieved credentials. // Get user requested model, if specified. 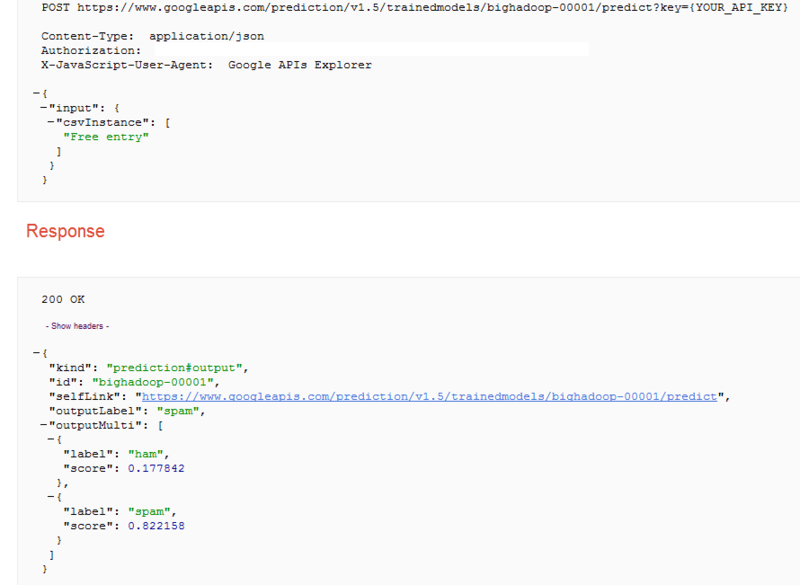 // Parse model descriptions from models.json file. // Setup reference to user specified model description. // to pass into the prediction request. // This loop is populating the input csv values for the prediction call.